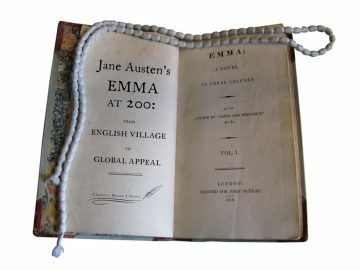 We are currently enjoying the final day of our ‘Emma at 200’ exhibition, which saw Jane Austen’s fourth novel placed back within the global context from which it sprung, and to which it contributed. The exhibition covered the global, family, literary and social contexts of Emma, and also explored its reception history and afterlives. As well displaying some real treasures, including the first French translation of Emma (Paris; 1816) the first and second American editions (Philadelphia; 1816 and 1833), and Charlotte Brontë’s wonderfully cutting letter to her publisher about Austen’s writing, the exhibition illuminated Austen’s connections with her contemporaries through her publisher, John Murray. John Murray’s authors included well-known writers such as Byron and Walter Scott, but also less well-known women writers, such as Maria Graham and Felicia Hemans. On display were several letters from the John Murray archive at the National Library of Scotland, and on Sunday 25th September, we will be delighted to welcome the archive curator David McClay, who will tell us some of the fascinating stories of those women published by John Murray. If you would like to join us, details can be found here. Jennie and her team (Dr Jenny DiPlacidi and Dr Koenraad Claes) have also just completed their two-year Leverhulme-funded project, an annotated index to just over 15,000 items in the Lady’s Magazine. The index forms a crucial research guide to the most popular and enduring monthly periodical for women of the long eighteenth century. You can find it, as well as more information about the project, here. Tony Grant’s review on the Jane Austen in Vermont blog. Anna’s review on her Austenised blog. Michael Caines’s review on the BSECS Criticks page.